A question we at Ford Racing Performance Parts are often asked is "Why do certain companies claim to make more power with their power upgrade kits than you do with your kits?" To address that question properly, it is necessary to understand some of the intricacies of chassis dynamometer testing as well as some of the compromises that must be made in order to simultaneously meet our standards for performance, emissions, durability and safety. An inertia dyno uses a large spinning drum that is accelerated by the drive wheels of the test vehicle. Power is then computed by knowing the inertia of the drum and how quickly it was accelerated. Torque can then be calculated by knowing the speed of the drum. An eddy-current (loading) dyno absorbs and measures power by rotating a metallic disc through a magnetic field. The amount of load applied by the eddy-current load cell will depend on the weight of the vehicle and the vehicle's unique coefficients input by the dyno operator that are used to simulate road load. The most common brands of eddy-current chassis dynos are Mustang Dyno and SuperFlow. DynoJet does make a loading dyno as well but most DynoJet shops are equipped with the inertia non-loading type. Eddy-Current loading dynos will typically show significantly more conservative (lower) power and torque numbers than inertia dynos for the same vehicle. The difference can be as much as 15%. Without getting into which dyno is more "correct" under what conditions, and why, we will simply say that these two types of dynos typically do not always give the same result even with all else being equal. It is generally not possible to accurately compare numbers from one type of dyno with those from the other type of dyno. Each type of dyno has its own advantages and disadvantages, but as long as all the tuning work is done on the same type of dyno, it doesn't really matter which one is used. With any dyno testing there is a need for correction factors that are applied to the raw numbers the dyno actually measures. These correction factors are an attempt to correct for varying atmospheric conditions such as humidity, barometric pressure and air temperature. The two most common standards are SAE J1349 and SAE J607 (sometimes known as "STD" on some dynos). How correction factors are calculated is given in the "Crate Engine" section of the Ford Racing catalog. For this article understand that these correction factors will give results that are different from each other, with SAE J1349 typically about 4% lower than SAE J607. OEMs will almost always quote J1349 corrected numbers when advertising horsepower and torque in the showroom brochure and vehicle literature. Some "tuning" shops will report STD numbers because they are always higher than SAE. Be sure to ask which correction factor is being used when comparing dyno numbers! Whenever comparing dyno results, always be sure that the numbers are corrected to the same standard. Despite these correction factors, atmospheric conditions can play an additional role in terms of ignition timing. The correction factors account only for the change in the density of the air due to atmospheric conditions and cannot account for things like engine borderline spark sensitivity. As inlet air temperature increases, the PCM will generally retard spark to prevent detonation using the particular octane of fuel for which it was calibrated. Correction factors cannot account for this because different engine designs can have different spark sensitivity and different sensitivity of torque relative to ignition timing. Basically this means that the closer the actual conditions are to the SAE J1349 standard (77 deg F inlet air, 29.31 inHg barometric pressure), the more comparable the results are to those quoted by the manufacturer. Unless otherwise explicitly stated, all horsepower numbers in the Ford Racing catalog have been determined by using the OEM SAE J1349 standard. Truly meaningful power numbers cannot be collected without this data! It is also a good idea to make sure the A/F ratio sensor (often called a "wideband" sensor) in use on the dyno has not been exposed to leaded fuel and has not been in service for an excessive period of time (greater than six months, depending on frequency of use). A/F ratio is the single most important parameter to measure accurately when doing any sort of dyno tuning, so it is critical the sensor is providing accurate information. When doing any PCM calibration on a dyno, the resulting calibration will only be as good as the A/F sensor. 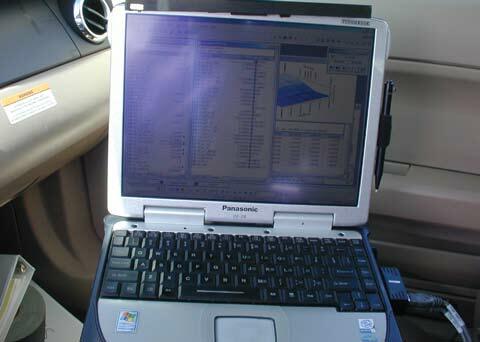 For Ford Racing calibrations, we use all of the data inputs listed both as mandatory and ideal. Most chassis dyno tests are performed using the "roll-on" method, where the vehicle's drive wheels are accelerated in a particular gear from a low speed to a high speed (generally to the rev limit of the engine) in one continuous sweep. Because of this constant acceleration,engine and transmission inertia, drive wheel inertia, tire characteristics, gear ratio and axle ratio can all affect the final measured horsepower. Generally a heavier wheel will take more torque to accelerate at the same rate as a lighter wheel, so heavier wheels will tend to reduce the measured wheel horsepower. Gear ratio comes into play because as the gear ratio strays from a 1:1, the efficiency drops and therefore the measured horsepower at the wheels also drops. This is why most dyno runs are run in the 1:1 gear (i.e., 4th gear in a 5-speed overdrive transmission) whenever possible. The same logic applies to axle ratio as well, which means that changing nothing but axle ratio can have an effect on measured wheel horsepower. Remember, this does NOT change brake (flywheel) horsepower, only the delivered wheel horsepower due to the change in drivetrain efficiency. When comparing dyno numbers, be sure the wheels, tires, gear ratio and gear, as well as all the other parameters previously mentioned, are the same from run to run! Production calibrations have an inferred (estimated) catalyst temperature protection model which constantly calculates/estimates the temperature in the hottest part of the hottest catalyst. This calculated temperature is based on many PCM parameters, such as engine speed, load, ingested air mass, time, inlet air temperature, EGR flow rate and many others. When the catalyst model calculates that the catalyst temperature is about to exceed a level that is safe for the catalyst (generally around 1650 deg F), the PCM will richen the A/F mixture as necessary to lower the exhaust gas temperature and cool the catalyst. This richened A/F ratio will decrease power output, but is absolutely necessary to keep the catalyst from being permanently damaged. Unless the A/F ratio is monitored during a dyno pull, the dyno operator will have no idea when catalyst temperature protection has been invoked and can make erroneous conclusions with regard to power output. As a trivial example of how this can affect dyno testing, consider a supercharged production vehicle with production calibration performing back-to-back runs under identical conditions except as noted. The car is driven to a dyno facility and immediately put on the dyno and a run is performed, yielding a result of 420 hp. In this example, A/F ratio is not monitored. A part is swapped for another "high-performance" part and another dyno run is performed, resulting in 430 hp. The dyno operator concludes the "high-performance" part is worth 10 hp. This is not accurate because when the car was first dyno tested, its catalysts were sufficiently hot that catalyst temperature protection was invoked during the dyno pull which reduced power output by richening the A/F ratio. While the car was having the parts swapped, the catalysts cooled down enough that during the next dyno pull catalyst temperature protection was not invoked. The engine made more power on the second pull because it was running a leaner A/F ratio closer to optimal and not necessarily because of the "high-performance" part. If the dyno operator was monitoring A/F ratio, this would have been readily apparent. If the operator was monitoring the A/F ratio commanded by the PCM, the activation of catalyst temperature protection would become self evident.In this example, the erroneous conclusion that was reached suggested the "high-performance" part was worth 10 hp when it really wasn't, but the opposite can also occur quite easily. Without covering every possible scenario, it will suffice to say that dyno numbers are ONLY meaningful when supporting data such as A/F ratio, inlet air temperature and the others listed above are also provided. There is also a model for oxygen sensor protection and exhaust valve protection that when not taken into account can cause misleading dyno data. In general, exhaust temperatures greater than about 1650 deg F can damage exhaust valves, and extreme care is taken in production calibrations to ensure that sustained engine operation beyond that temperature does not occur. This is rarely an instantaneous failure but rather one that over time "tulips" the exhaust valves and ultimately will fail the engine. Aftermarket cold air kit manufacturers that claim to work without the need of a PCM recalibration are a common source of misleading dyno power claims. Some of the manufacturers of these kits claim enormous power gains using nothing but their kit and a production calibration. Most of these claims are not supported with A/F, inlet temperature or spark advance traces during the dyno pulls that are shown in their advertising. In some cases, the apparent increase in power is due to differing dyno test conditions as mentioned previously, while in other cases they can be due to the fact that the MAF sensor transfer function in the PCM is left stock. If the cold air kit flows more air and the MAF transfer function in the PCM is stock, it will not "know" about the extra air that's entering the engine. This will result in the engine running an A/F ratio that is leaner than it should be for engine durability. While this has the potential to produce more power, it can also be potentially damaging to catalysts, exhaust valves, piston rings and other engine components. The commanded spark advance can also be incorrect and result in detonation or pre-ignition with potentially catastrophic results. One should be very suspect if a particular cold air kit claims a huge power increase over stock at low engine rpm and without a calibration. Air inlet restrictions generally only become significant at higher airflows, so if a claim is made that a cold air kit increases torque at 2000 rpm without the aid of a calibration, you can be sure that varying dyno test conditions or a significant change in A/F ratio are the cause. Ask for more supporting data! Similar misleading results can be caused by a failure to keep inlet air temperature constant between runs. The PCM will retard spark timing to prevent detonation as inlet air temperature increases, lowering power output. On a forced-induction car, the inlet air temperature is generally measured after the power adder (and after the intercooler, if applicable) and can be MUCH greater than ambient temperature. Careful monitoring of A/F ratio and inlet air temperature are critical to making accurate conclusions regarding the effectiveness of various high-performance parts. Secondary factors that also affect measured wheel horsepower are engine oil temperature, differential oil temperature, humidity, etc. It simply cannot be overstated that all conditions need to be as similar as possible between dyno runs in order to have a meaningful scientific conclusion, which requires the supporting data previously discussed. The calibrations that Ford Racing provides for our cold air and supercharger kits are done by Ford engineers who, in many cases, worked on the actual production vehicles. No one is more familiar with Ford engines and Ford control systems than Ford engineers. Extreme care is taken to provide as much power and torque as can be safely delivered, but also to deliver extremely high durability and exceptional drivability. Most of our kits are also 50-state emissions legal and many are now even offered with a warranty when dealer installed. Turning off the inferred catalyst, oxygen sensor and exhaust valve temperature protection logic discussed in the previous section. This prevents the PCM from richening the A/F ratio to protect these components which can result in more power under certain conditions. The downside is drastically decreased durability of these expensive components, which can result in the check engine light coming on as well as increased exhaust emissions due to failed catalytic converters. Ford Racing does not compromise durability or emissions by turning off this calibration logic. They often advance spark timing to potentially unsafe levels. We test our calibrations in a wind tunnel and in hot dry weather to verify that potentially damaging spark knock or catastrophic pre-ignition does not occur. We also do cold weather and altitude testing as well as extensive emissions and durability testing on several vehicles before we release a calibration to the customer. Most other companies do not have the time or the resources to do the same type of testing that we do. Some companies do not realize that they need to perform this type of testing in the first place! Automatic transmission calibration is an area where Ford Racing sets itself apart from other "tuners." We generally make extensive calibration changes to not only improve shift quality and give the transmission a more performance-oriented feel, but take great care to ensure that durability is not compromised to levels we feel would be unacceptable to a customer. In development we monitor things like clutch slip times, slip energies, band temperatures and other variables to make calibration changes as appropriate so that the customer can be sure of a quality product that will continue to deliver improved performance in the long-term. As mentioned before, these changes are performed by the same engineers who designed and developed the vehicles in the first place, and who are more familiar than anyone with their performance and durability envelopes. Many of our competitors develop their calibrations exclusively on a chassis dyno and go straight from there to the end customer. While dyno work is a critical part of the development process, it is only one piece of a very complex puzzle. Calibrating for wide open throttle (WOT) is generally simple, but the bulk of the calibration effort is getting the part (and closed) throttle drivability correct. Our calibrations are developed not only on the dyno, but also on the street for production (or better) quality drivability, and across many vehicles to allow for manufacturing tolerances. Varied driving conditions, constant data monitoring and long-term testing ensure consistent drivability and exceptional durability. In recent years, cars and trucks have shifted toward electronic throttle control (ETC) or "drive-by-wire" systems for packaging, cost and enhanced calibration functions. 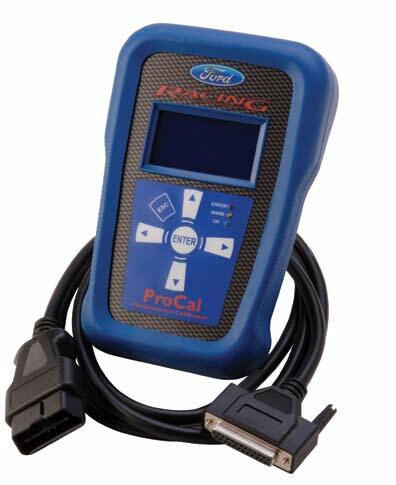 Ford Racing calibrations for ETC vehicles take advantage of some of the increased functionality offered by these systems by changing the relationship between the pedal and the throttle for improved "performance feel." This allows us to provide substantial improvements in "performance feel" even on the kits where the peak horsepower increase might be considered modest by some. The peak power numbers do not always tell the whole story. 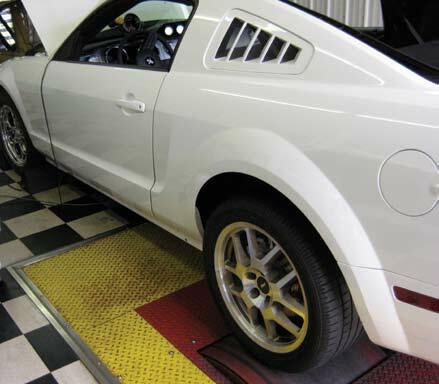 Some claims are due to poor and misleading dynamometer test practices as well as a fundamental lack of understanding of the way Ford PCMs work. Others are genuine but at the expense of engine, catalyst or drivetrain durability and emissions. Hopefully this article gives you the tools necessary to determine what is real dyno horsepower, manipulated false horsepower and temporary horsepower waiting to cause a failure. We are confident that as a potential customer you will agree that no one knows your car or truck better than the Ford engineers who designed it in the first place. Our kits offer the best blend of performance, durability, and drivability that exist on the market today.